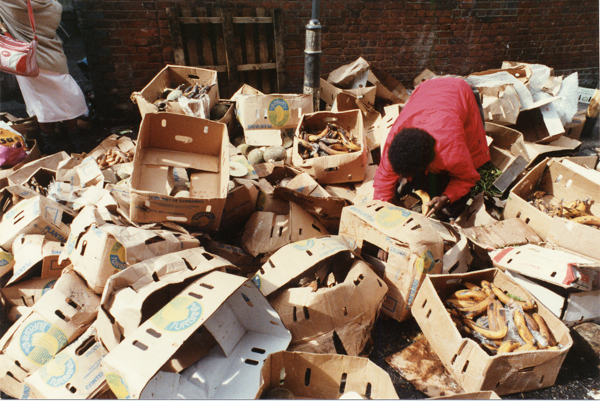 In 1988, the Bishopsgate Institute staged an exhibition entitled A Farewell to Spitalfields curated by John Shaw and Raphael Samuel, the distinguished historian of the East End. 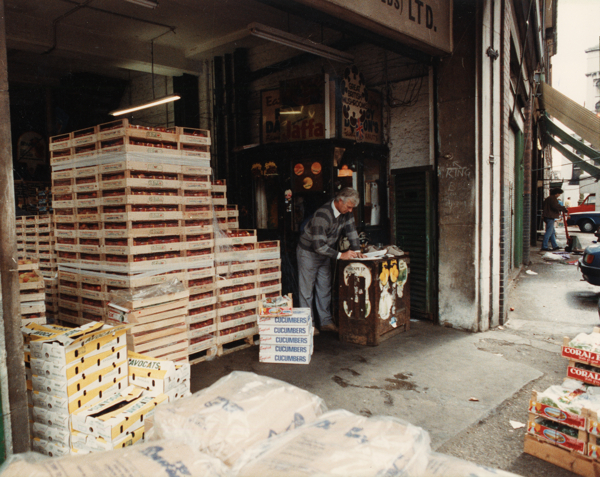 The purpose was to assess the history of Spitalfields in the light of the changes that were forthcoming, as a result of the closure of the Truman Brewery and the Fruit & Vegetable Market – and it is my pleasure to publish these excerpts from Raphael Samuel’s introductory essay accompanied by David Bateman’s photographs of the Spitalfields Market, commissioned as part of this exhibition. A quarter of a century later, it is sobering to recognise the prescience of Raphael Samuel’s words. He was a historian with strong opinions who, on the basis of this article alone, demonstrated an ability to write about the future as clearly as he wrote the past. 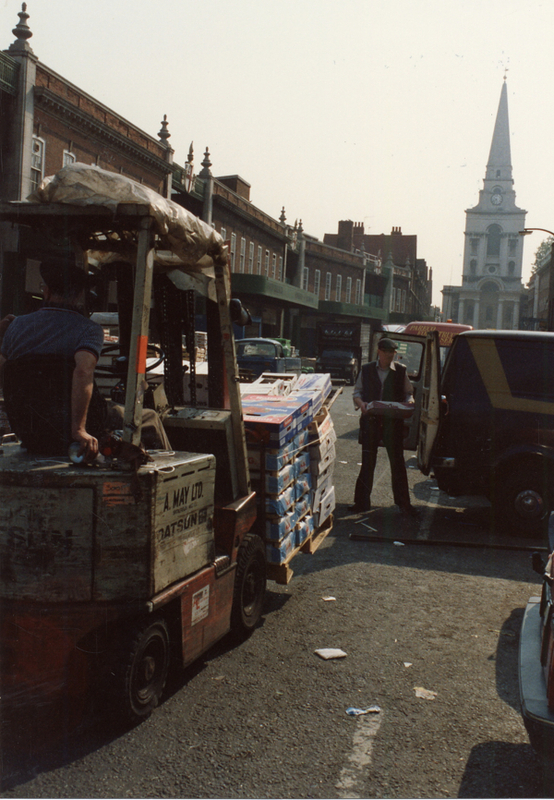 The Spitalfields portrayed in these pictures has gone and now – for better or worse – we live in the Spitalfields that Raphael Samuel, who died in 1996, wrote of yet did not live to see. Spitalfields is the oldest industrial suburb in London. It was already densely peopled and “almost entirely built over,” in 1701 when Lambeth was still a marsh, Fulham a market garden and Tottenham Court Rd a green. It owes its origins to those refugee traditions which, in defiance of the Elizabethan building regulations, and to escape the restrictions of the City Guilds, settled in Bishopsgate Without and the Liberty of Norton Folgate. Spitalfields is a junction between, on the one hand, a settled, indigenous population, and on the other, wave upon wave of newcomer. Even when it was known as ‘The Weavers’ Parish,’ it was still hospitable to many others – poor artisans, street sellers, labourers among them. In the late nineteenth century Spitalfields was one of the great receiving points for Jewish immigration and the northern end of the parish provided a smilar point of entry for country labourers. 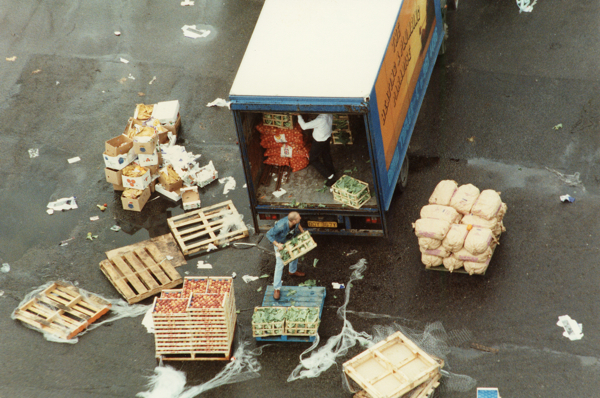 There was a whole colony of them at Great Eastern Buildings in the eighteen eighties, working as draymen at the brewery, and another at the Bishopsgate Goods Station. This ‘mixed’ character of the neighbourhood is very much in evidence today. 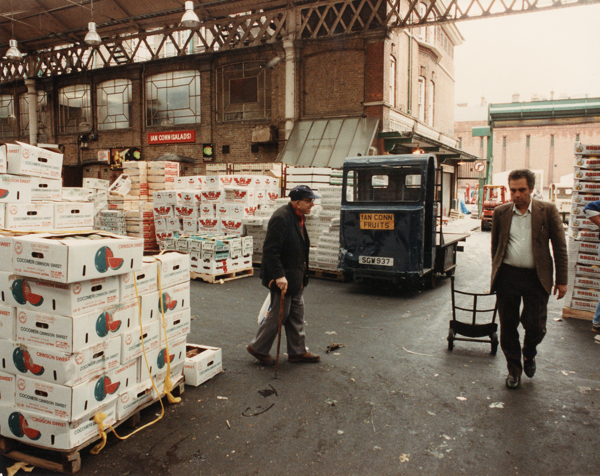 Spitalfields Market – threatened with imminent destruction by a coalition of property developers, City Fathers, and conservationists – is almost as old as Spitalfields. It was already in existence when the area was still an artillery range. In John Stow’s ‘Survey of London’ (1601) it appears a trading point “for fruit, fowl and root.” A market sign was incorporated in the coat of arms for the Liberty of Norton Folgate in Restoration times, and the market’s Royal Charter dates from 1682. 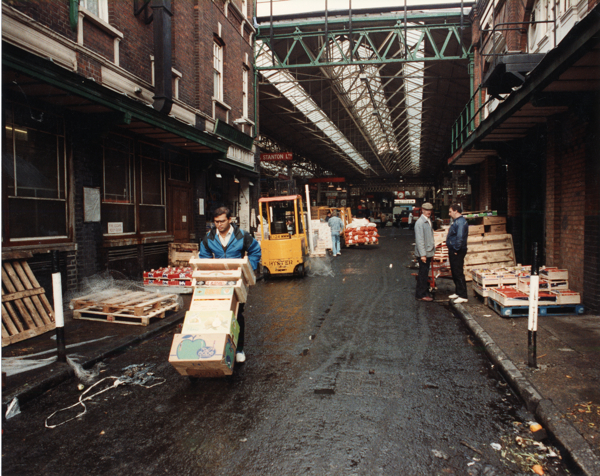 The market, in short, preceded the arrival of the Hugeunots and has some claim to being Spitalfields’ original core. 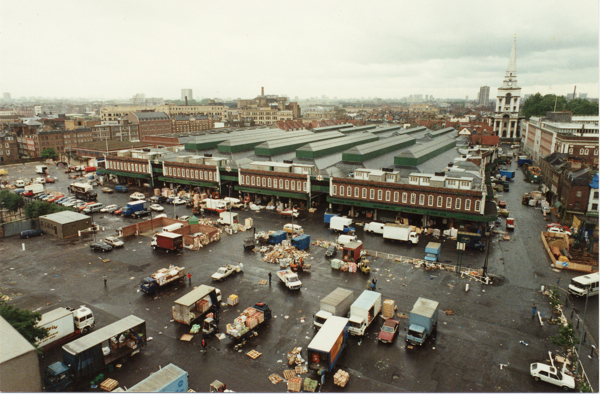 The market continued as a collection of ramshackle sheds and stalls until it was transformed, in the 1870s, by Robert Horner, who bought the lease of the land from the Goldsmid family in 1875. Horner was a crow scarer from Essex who, according to market myth, walked to London, became a porter in the market and eventually got a share in a firm. 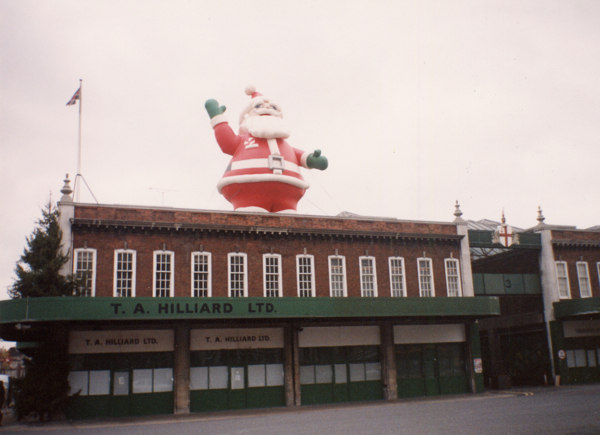 Ambitiously, he set about both securing monopoly rights for the existing traders, and replacing the impromptu buildings with a purpose built market hall – the “Horner” buildings which today is the oldest part of the market complex. 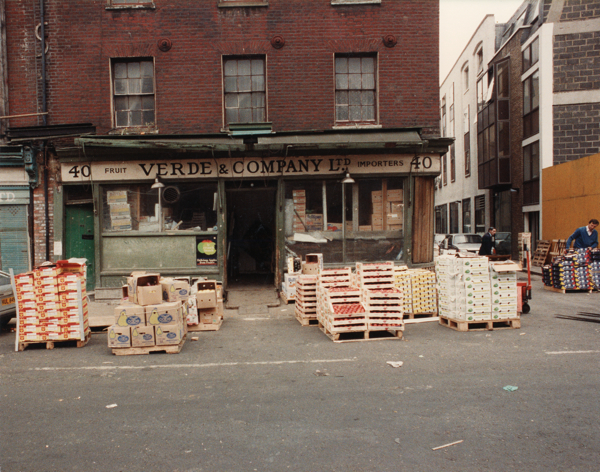 The older, eastern portion of the market is the direct product of Robert Horner’s vision of his own situation. It is built in the manner of the English Arts & Crafts movement. On its own terms, the old market is a pleasing piece and a worthy addition to the diversity of Spitalfields. Its rusticated archways on the Commercial St facade and the repeated peaks of the roof with their smallish sash windows lend a clearly Victorian flavour to Commercial St, which was largely a Victorian venture anyway. Inside the market it is a vintagely Victorian hall of glass and iron of unassuming beauty, even more so when at work, then its true worth as a genuinely functioning piece of Victorian space is revealed. Like St. Pancras in a different way, it has an element of the museum and an aesthetic that overlays the original construction upon utilitarian principles. 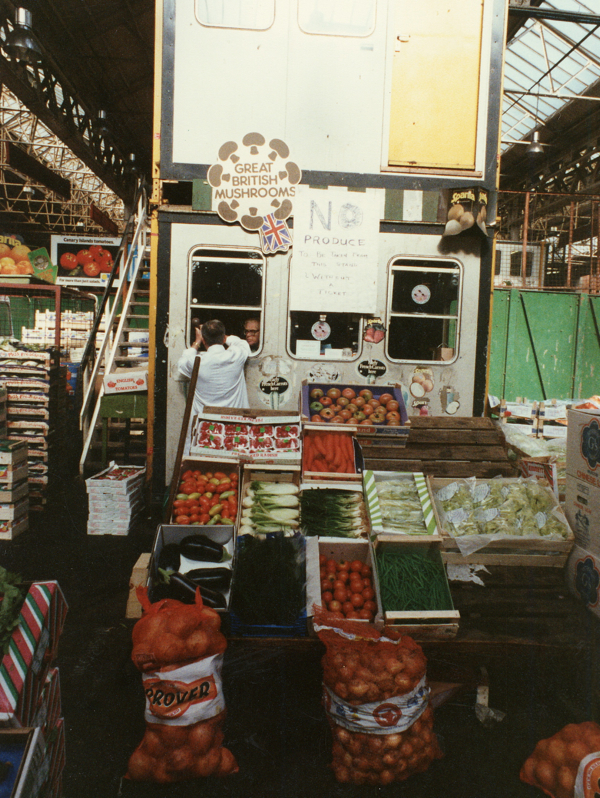 Most of all the old market appears as a peculiarly English space. An effect that is heightened by the lavish use of ‘Wimbledon’ green. It is that deep traditional green that characterises English municipal space and that, in this case helps to marry the market to the discordant additions of the late 1920′s and to give distinction to the territorial boundaries of the market that have been historically more fluid. 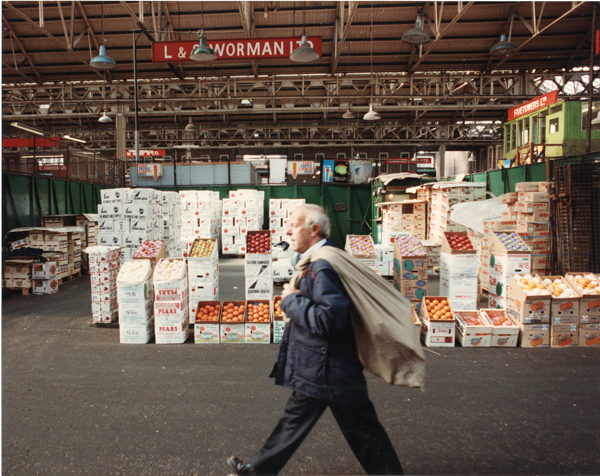 The old market is a celebration of trade, a great piece of Victorian working space, not only of great historical value itself, but contributing to the visual manifestation of the historical development of the whole of Spitalfields. It is a worthy layer in an area that grew by a sort of architectural sedimentation. Hawksmoor’s Christ Church, the Huguenot fronts of Artillery Passage, the Georgian elegance of Elder St and the smaller houses of Wilkes St and Princelet St, the mid-Victorian utility of the Peabody Buildings, the rustic character of the old market, the twentieth century neo-classicism of the Fruit Exchange and several examples of a more unspeakable modernity are some among many accretions which contribute to make Spitalfields what it is. The most perfect example of a palimpsest in which diversity rather than Georgiana or Victoriana represent the true nature of the area. The character of a district is determined not by its buildings, but by the ensemble of different uses to which they are put, and, above all, by the character of the users. It should be obvious to all but the self-deceived, that to stick an international banking centre in the heart of an old artisan and market quarter, a huge complex with some six thousand executives and subalterns, is, to put it gently, a rupture from tradition. The whole industrial economy of Spitalfields rests on cheap work rooms: rentals in the new office complex are some eight times greater than they are in the purlieus of Brick Lane, and with the dizzy rise in property values which will follow the new development, accommodation of all kinds, whether for working space or home, will be beyond local people. 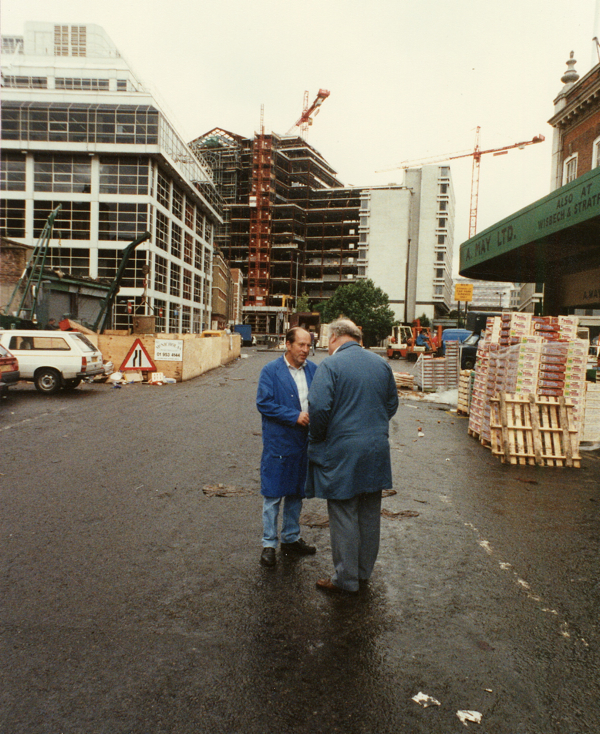 The market scheme will mean a social revolution, the inversion of what Spitalfields has stood for during four centuries of metropolitan development. 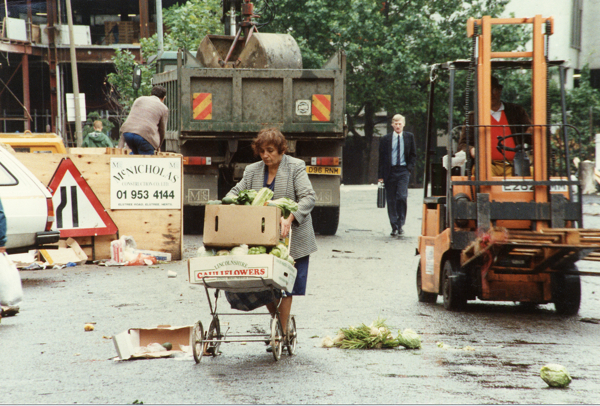 The fate of Spitalfields market illustrates in stark form some of the paradoxes of contemporary metropolitan development: on the one hand, the preservation of ‘historic’ houses; on the other, the wholesale destruction of London’s hereditary occupations and trades and the dispersal of its settled communities. 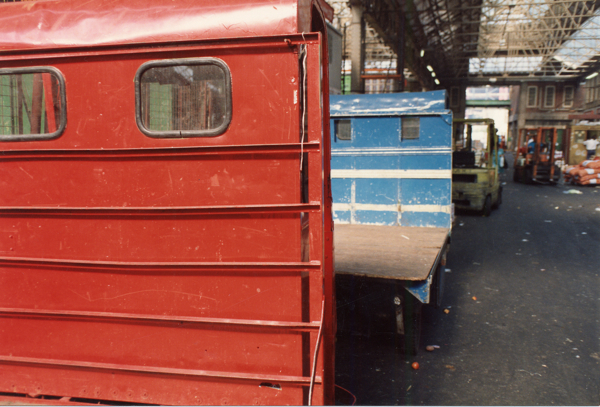 The viewer is thus confronted with two versions of ‘enterprise’ culture: the one that of family business and small scale firms, the other that of international high finance with computer screens linking the City of London to the money markets of the world. 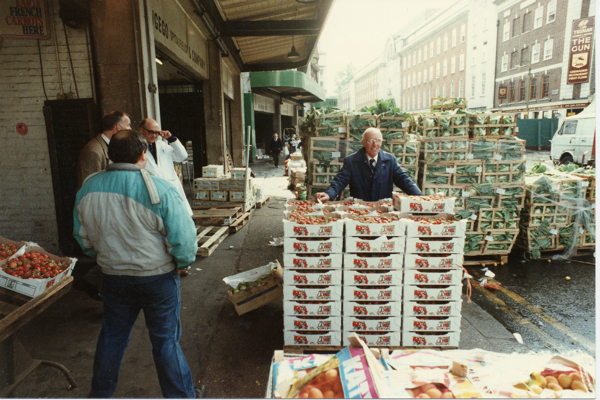 This set of photographs by David Bateman show something of the activity of the market today in what – if the Second Reading of the Market Bill continues its progress through Parliament – are likely to be its closing months. 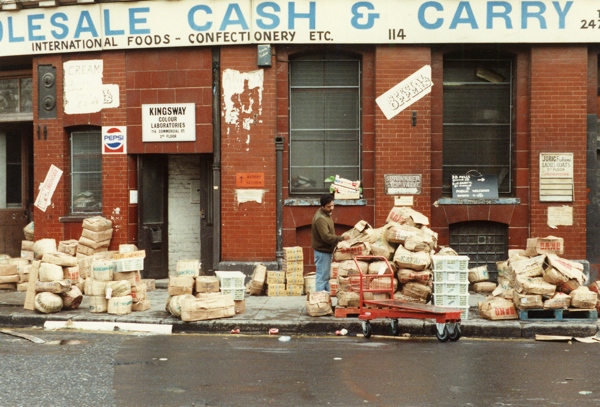 I was fascinated to read Raphael Samuel’s words, because through my own work I am aware of the resilient culture of artisans and small tradesmen that persists in Spitalfields, against all the odds, carrying the history of the neighbourhood just as much those historic houses. Fruit & veg market a beautiful building, I didn’t go until the 90s and it was bits and bobs market – my friends sold lightboxes they made. The new wave. 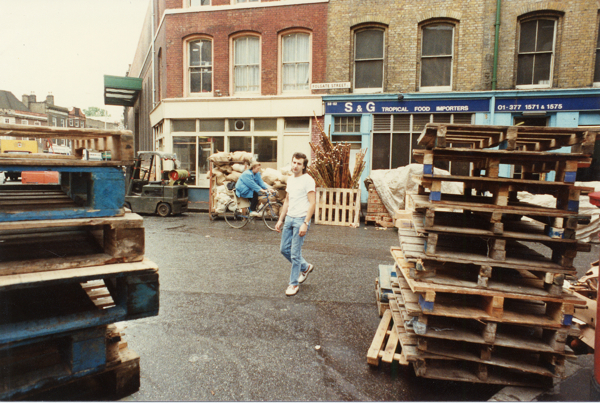 That was a good market too though, better than the one now which is much chainstore market tat, as opposed to individual’s market tat – much like Camden etc etc. 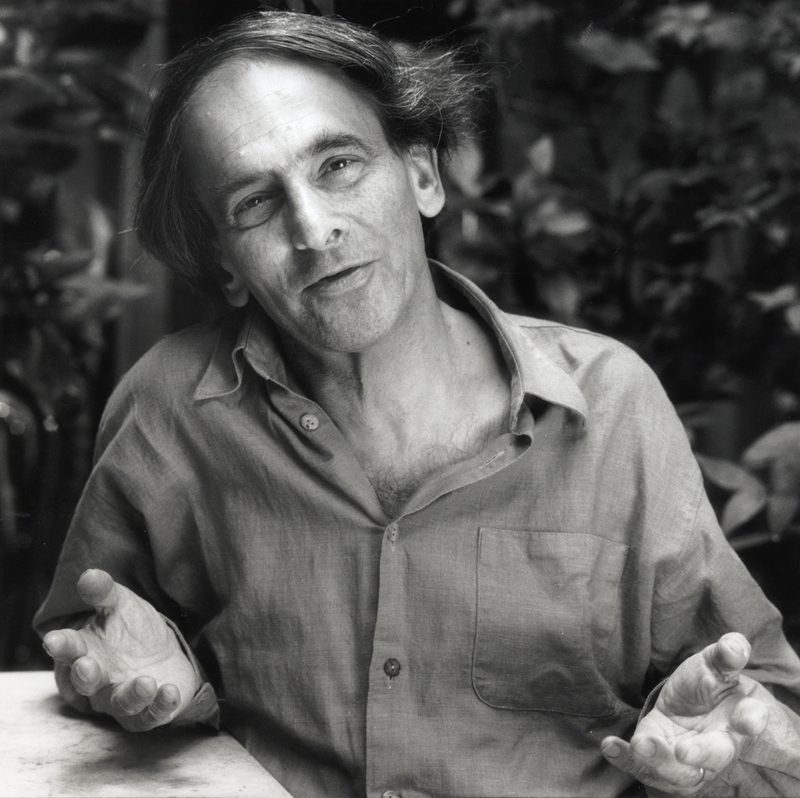 I bet very few people in the market now know the ‘market myth’ about Robert Horner. Wonderful to see Raph’s photo at the end of the piece. A lovely man and a great historian. Stolen from us far too early. This brilliant article exactly sums up what is happening at this moment all over London with the small work places under constant threat of destruction in favour of unaffordable -to local workers- high rise blocks of offices and apartments. What a crime to wipe away this vibrant place! Beautiful photos, so nostalgic. Raphael was a lovely man. Great photographs.